I have a 15 ft trailer on which I'm planning to build a plywood/pmf camper. The idea is top have a hatch at the back so I can slide in a 14 ft open canoe for transport. It needs to sleep 4 too so it has to be a fair size.....the missus is also keen on being able to stand up. That might have to change.I don't really want to build a full size caravan. We're planning on treating it more like a tent than a camper, we'll dry it afer use each time and keep it under cover so it's out of the rain. So that means no insulation, just the one layer of ply, but the thing I'm not sure about is how thick should that layer be? Preferably as thin as possible esp if I end up building it high enough to stand in. Would I be able to get a way with 6mm ply? Do you guys also use the external grade ply? What works for a lil' 4x8 camper DOES NOT - repeat - DOES NOT SCALE to a camper of the size you are considering. Many of the rules of physics - force due to wind load, strength in bending, torsional strength, column collapse - have exponential factors. That means that small changes will have a big impact! If you are suggesting that you should build a 1/4-inch (6mm) solid plywood wall ... in my humble opinion ... no. No no no no. It would be stretching the limits of adequacy even if used for a tiny teardrop, where it's ideally fastened along the entire top and bottom, usually the sides, and reinforced by the bulkhead and any cabinetry. There are dozens of potential problems. How will you fasten sheets of 1/4-inch plywood to maintain continuous strength? Can you account for plywood expansion (which WILL be a factor in a 15-ft long camper)? What about warping? Will the plywood hold when you accidentally run over roadkill or a blown tire? If you're driving into a 60-mph windstorm at 70 mph, will your structure hold up to a 130-mph headwind? Will your walls buckle under a snow load? Campers that size aren't built using solid walls. They're either built with laminated sidewalls, wooden framed superstructures, or aluminum stick n' tin siding (cargo trailer), all of which have a fairly steep learning curve for the first-time builder. I hope I don't sound arrogant or preachy. I don't mean to! But this thing is going to be going down the road at 60-70 mph, and it needs to be safe! For both your sake and the sake of everyone driving around you. Either build a tent, or build a camper. I TOTALLY understand the desire to build affordably and easily. But a 15-ft camper, I'm afraid to say, is neither particularly affordable or easy, and there's no way to change that. I'd recommend looking into a conventional stick-framed camper, which is framed and sheathed similar to house. You can build it using local materials and basic tools, and there's lots of information about how to do it. It's the easier to wire or plumb if you ever need that, too. If you're on a budget, just use fiberglass batting or EPS board for the wall insulation, paint the interior sheathing, PMF the exterior, and use vinyl flooring. I agree with Andrew... what can work for a 4x8 will not scale up to a 15 footer, unless great care is taken to address the specific strengths and weaknesses of practically everything you might want to use in building it. For instance, take my trailer...please! (sorry, old joke there) It is 4x8, overbuilt using 3/4" plywood, 1/2" oak inner trim and inner framing, and steel bracketry and 1/4" bolts. I also used double the adhesive needed, and triple the paint. Not to stop there, I also reinforced the frame using 1/4" steel and a larger, heavier axle and spring set, than I might've. Altogether with excess equipment on-board, it is now 2025 lbs (and growing with each new modification)>>> way beyond the norm for a 4x8 "tiny trailer". If scaled up to 15 ft, I could be looking at 2 tons or more, as I could easily find more mods to make, and more gear to carry along. My TTT is extremely strong, and has shown no signs of deterioration, though I have slung it round roughly, been airborne a coupla times, and ripped away one spring hanger; the box structure itself is so firmly put together, that there is no flex or give to it, which is alright for short thick spans of plywood (especially when seamed with forgiving poly adhesive), but when longer lengths of wood/plywood are used, some flex is inevitable, more so if layered into a composite skin, with the components seprating. Though I didn't use roof spars, my main roof piece is only 51"x 48", with only 980 sq. inches unsupported by thick steel brackets, 3/4" bulkheads, or 3/4" standing walls (there is also the oak frame round the doors and front slope of the roof holding it firm). Even it has never sagged, or racked to a side, remaining perfectly aligned, after 6.5 years. I can't imagine how much more weight of wood and hardware it would take to scale-up my 4x8, to come near to how strong it is, to nearly double its' length, and possibly making it taller. Certainly, I would have to incorporate many design changes, perhaps even going to the 1/2 plywood + 1/2 foam hybrid I once contemplated for second build, and might never come close to what I desired in the durability /strength checkbox I chose, instead of going lighter (and insulated). I'm sure that a trailer of that size can be made to fit many requirements, but it will not be easy, if first-build, especially if not experienced in several necessary skills needed for doing so, and knowledgeable of materials and techniques for putting them in place. I had no such mastery at my command then, when I started my build, and very little more, now. I disregarded much of what I was shown here, in favor of doing it all my way; my TTT ended up pretty much as I envisioned, but not "pretty", nor as good as it could've been, if I had followed conventional wisdom, and built like was suggested to me by more experienced builders. Good luck on your build! thanks guys, not patronising at all. this is exactly the advice i was looking for. This will be a big project for me si i'd like to keep it as simple as i can. I was worried about strength, the plan i have in my head meant 4 vertical sheets of ply, my next question was going to be how to frame it all together. Given your advice, i've binned that idea....and my other half has finally caved in and realised she won't be able to stand in this thing. So, here's the next plan......please point out any glaring issues! So, we'd also like it to be large enough for 2 adults and 3 kids to lounge about in on the odd rainy afternoon. So, could it work if I cut it down to 3m long by 1.40 high? Then it'd be one single sheet of ply for each side wall and I could go thicker too. 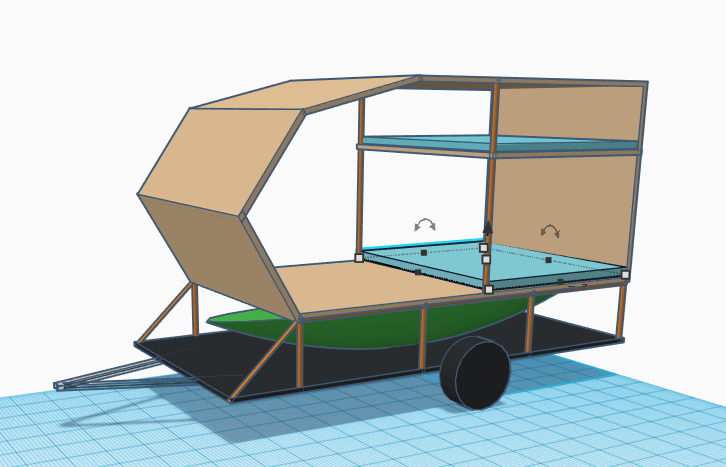 We do still want to get a 14ft canoe on the trailer so I want to build a cage or raised floor to set the pod on so the canoe can go underneath. I have no welding experience and dont' fancy getting into it. I was wondering if it would be ok to build a raised sort of cage using tubeclamps....this sort of thing? I've never seen it used on a trailer,too heavy maybe or perhaps it just shakes itself loose? I'm thinking of a lo fi and lower version of this with a long teardrop on top. I'm also having worries about the thing getting too high, i'd like to keep it as low as possible. The canoe needs about 50cm clearance so it'd be over 2m high.....I might make the roof of the pod even lower, enough to sit up in would be fine. If i had my way i'd just make a long low pod with a hatch at the back, then slide the whole damn canoe inside for transport. with vinyl floor i'd be fine with that, my other half, not so much. I'd recommend you get a car top carrier for the canoe. You can rarely park next to the water. It also allows more design freedom for the trailer. We usually have a couple of kayaks along for the ride too, I'm hoping I can fit all three on the trailer or at least two of them. When I'm doing shuttle runs I'll use the car roofrack but for long distance journeys down to the south of france or to scotland I'd rather have them on the trailer. We also find it easier that way because we usually stop a lot en route. if the car is unloaded you can take a drive into town and leave all the kit nice and safe on the trailer in the campsite rather than having to worry someone is going to steal your kayak from your roofrack while it's parked up in town. This is kind of what i'm thinking.....i think it'll have to be lower though, the pod is probably too high here.I could probably lose a fair bit more height. Be aware of that with that design you might run into the problem of being top heavy, not a good idea for a trailer. yep, the lower the better. she is not going to be pleased. I really would rather just slide the boat inside the pod. Could you put the boat pod on top? Maybe you could use the ceiling space when the boat isn't there. Removable Bars inside? I might have to, although i really would like to be able to have them underneath for ease of storage....plus I can strap barrels of kit, bikes and all sorts under there. If I went as thin as 9mm for the walls with studs internally and finally all wrapped in pmf.... would that be strong enough with regards to wind while driving? My other half has realised building something we can stand in might be a bit much so at the moment I'm thinking of something that's 3m long and 1.4 high max. I'm not sure how it all fits and is not too tall but will leave that. I think for a cabin with no frame and not a sandwich panel, for the walls at least you need to use 3/4" (19mm) or maybe 5/8" (15mm) ply and over 15 feet have a pretty stout "bulkhead" so its more like two 8' cabins butted together. The bulkhead might be just a wide framing, but its going to be tough to not see the the middle between ends 15' apart not deflect a lot IMHO. Especially if tall and no opportunity for stiffening in the kayak compartment. Building flat roof means you don't have the advantage of a curve there to add stiffness. You've set some tough challenges for yourself. I only wish you good luck. ok, taking all the good advice here I've remodelled it a bit. The sleeping pod is now smaller, 3m x 2m and about 1.5m high. That'll sit on top of the metal rack which is 50cm high. I'll go with 18mm thick walls covering an internal frame and also a curved front end. My other consideration is weight although I think if I build small pod I'll be well undr the limit for this trailer since it's currently carrying a huge caravan. Does this look more realistic? kayak-camper wrote: ok, taking all the good advice here I've remodelled it a bit. That is a fascinating design. That's a lot there to figure out, though. I don't know how detailed your sketch shows your ideas ... for instance, you don't show the necessary cross-bracing for the "foundation" of the sleeping pod. Is it supposed to be made out of wood? If you have the skills, maybe use metal. Especially since it's exposed to the elements like that. I know a guy who's building a supersized teardrop. He's just building a 5-ft (1.5 m) tall shell and then installing a false floor about a feet above the real floor, and then installing doors and hatches to access the hidden space. That sounds a lot more reasonable than designing an open underfloor compartment for the kayaks. Maybe just build a 2-m tall shell with a false floor high enough to accommodate the kayaks sliding in underneath? I've seen it used before on the back of flatbed lorries to make racks for stock, tools, etc....I was a bit worried the clamps could work themselves loose but the supliers I've spoken too siad that isn't an issue and if i wanted to put my mind at rest I could have them welded in place. The other option is to have a cage welded/built for me. I'm not too confident in my carpentry to be honest so I'd prefer to build a small pod rather than a full height one, like you said I think I'd have trouble making sure it doesn't bend or flex. I did play around with a full height design and I'd need to use 4 vertical pieces of ply for each side, I'm not sure I could make that strong enough. A false floor would probably be simpler than a metal work foundation though....also I need to work out how much all that metal will weigh. I'll have a look around at some of the designs on here anyhow, there was a small standy one I think but it was a lot shorter than the 14 ft I'd need for the open canoe.